Achilles welcomes anyone with a disability who wants to run or walk, or those who want to be a volunteer guide. As a member, you can attend Sunday training and can train for and enter events such as City2Surf, fun walks and runs, half marathons, full marathons or even ultra-marathons. Some Achilles members are experienced athletes and others are exercising for the first time. The only prerequisite is an interest in exercise and a willingness to try. Achilles members enjoy the companionship of other members and volunteers and the lift one gets to both body and mind from regular exercise. You needn't worry about what to wear for your first workout. We suggest that you wear wearing something loose and comfortable, suitable for the weather. Don't be concerned about being out of shape. Whether you are fast or slow or can go short or long distances, we welcome you. Come along and introduce yourself at one of our training sessions, new members and volunteers are always welcome. As a volunteer you are not expected to be a professional, or an expert on health or fitness or physical disabilities. You are expected to ensure your own safety and the safety of the person you are guiding. You will need to be able to effectively communicate with the person you are guiding. You will be given instructions on how to guide before being expected to guide someone on your own. As a guide, you will always be partnered with someone who is slower than yourself. Besides helping others to exercise, guiding should be fun. We recommend that all volunteers familiarise themselves with our tips for guiding - click here - before their first session. 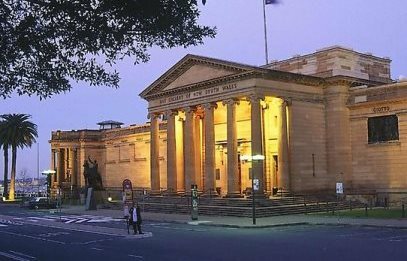 You will find us at 8.00 am on most Sunday mornings, rain, hail, or shine, on the steps of the Art Gallery of NSW opposite the Domain. Sometimes, however, we need to shift our Sunday training to Centennial Park. Details of likely changes can be found on our Sydney Events page. We will also advise members ahead of each change.